On the basis of the nature of the dispersed phase and the dispersion medium, two types of macroemulsions can be distinguished: (i) If the continuous phase is an aqueous solution, and the dispersed phase an oil, the system is called an o/w emulsion. Such an o/w emulsion is generally formed if the aqueous phase constitutes more than 45% of the total weight, and if a hydrophilic emulsifier is used. (ii) Conversely, if the aqueous phase is dispersed within the oil, the system is called a w/o emulsion. w/o emulsions are generally formed when the aqueous phase constitutes less than 45% of the total weight and if a lipophilic emulsifier is used. Generally, o/w emulsions are more popular than w/o emulsions in the pharmaceutical field, especially when they are designed for oral administration. In the cosmetic industries, lotions or creams are either of the o/w or w/o type, depending on their applications. o/w emulsions are most useful as water-washable drug bases and for general cosmetic purposes, while w/o emulsions are employed more widely for the treatment of dry skin and emollient applications. It is important for a pharmacist to know the type of emulsion since it can significantly affect its properties and performance. There are several methods to determine the emulsion type, as summarized in Table 4 (121). Multiple emulsions are more complex systems (25,122,123). If a simple emulsion is further dispersed within another continuous phase, a triple emulsion is obtained, which can again be dispersed within a further continuous phase, etc. Figure 7 shows as an example the two preparation steps for a water-in-oil-in-water (w/o/w) emulsion: In the first step, an aqueous phase is added to an oily phase containing a lipophilic surfactant. Abbreviations: W/O, water in oil; o/w, oil in water. Figure 7 Schematic presentation of a two-step preparation procedure used to obtain a water-in-oil-in-water (w/o/w) emulsion. Upon mixing, a w/o emulsion is formed. In the second step, this w/o emulsion is poured into a second aqueous phase containing a hydrophilic surfactant. Upon mixing, the multiple w/o/w emulsion is formed. Multiple emulsions can be end products or serve as intermediate products, for instance, during the preparation of drug-loaded microparticles (124-126). The use of multiple emulsions, such as w/o/w, o/w/o, w/o/o, and w/o/o/o emulsions, can, for example, help to reduce drug loss into an outer aqueous phase and, thus, increase the resulting drug encapsulation efficiency. Figure 8 A hypothetical pseudoternary phase diagram of an oil/surfactant/water system with emphasis on microemulsion and emulsion phases. 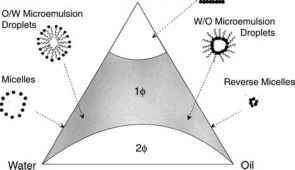 Within the phase diagram, existence fields are shown where conventional micelles, reverse micelles, or water-in-oil (w/o) microemulsions and oil-in-water (o/w) microemulsions are formed along with the bicontinuous microemulsions. At very high surfactant concentrations two-phase systems are observed. Source: From Ref. 130.
allow for a wide range of potential practical applications (134-139). However, there is still substantial controversy concerning the exact nature of these systems and the appropriateness of the terminology. Terms such as "transparent emulsions," "micellar solutions," "solubilized systems," and "swollen micelles" have all been applied to the same or similar systems. Nonetheless, emulsions and microemulsions may be differentiated on the basis of particle size: microemulsions contain particles in the nanometer size range (typically 10-100 nm), whereas conventional emulsions (or "macroemulsions" or "coarse emulsions") contain particles in the micrometer range. 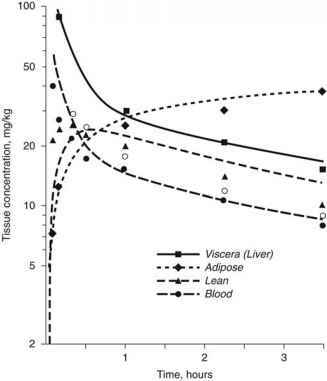 Liposomes are vesicular lipid systems of a diameter ranging between 50 nm and a few mm. They are composed of membrane-like, lipid layers surrounding aqueous compartments. The lipid layers consist of phospholipids, making liposomes biocompatible and biodegradable. The phospholipids have a hydrophilic head and a lipophilic tail. Different preparation methods for liposomes have been described by Vemuri et al. (140), leading to different types of vesicular structures (Fig. 9) (141). Nowadays, liposomes are widely used for drug delivery and drug targeting (142-147).